In August of 2001, TMS President Kim Pedersen visited Seattle for two weeks. What follows are photographs he shot of the famous Seattle Center Monorail, which has been operating since the 1962 Century 21 World's Fair. Along with the photographs are descriptions and commentary by Kim. He came away from Seattle with a new appreciation for the venerable original ALWEG-design. As always, photographs are copyrighted by the Monorail Society. It's only 1.2 miles long in length, but it continues to carry thousands of passengers from downtown to the Seattle Center day after day. Even more impressive, the monorail makes a profit with trains that were first built 40 years ago. 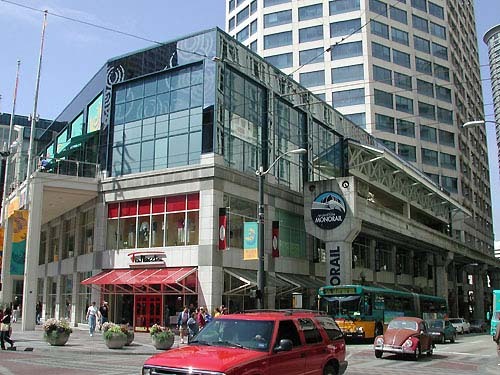 We begin our visit with a look at the downtown Westlake Center station. In the 1980's the track was altered from a former over-street station to hugging against the side of this then-new mall/business complex. Part of that reconstruction included pinching the guideway together so only one train can be at Westlake at a time. 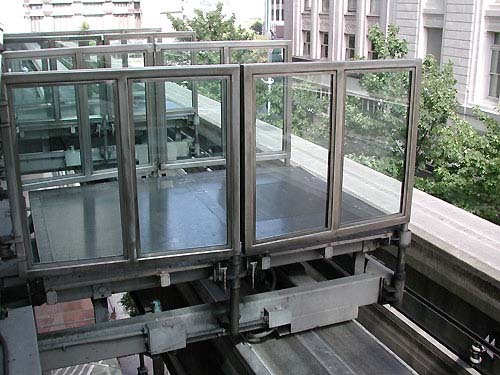 The outside track is accessed by the most troublesome mechanical devices for the Seattle Monorail maintenance crew, the retractable ramps. Seattle Monorail Services has had plans to rebuild the station to a two ramp station once again and eliminate these ramps, but that process has dragged on already for years (red tape?). 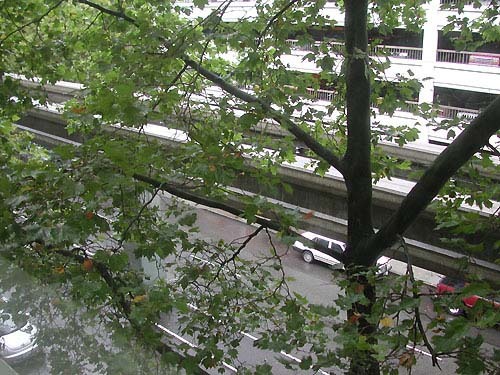 Here's an unusual case where both trains are near the Westlake Center at the same time. Note how the track pinches together after the curve. The "Red Train," in the foreground, is making non-revenue runs for driver training and is actually stopped here while trainer and driver walk from one end to the other to go back to Seattle Center. 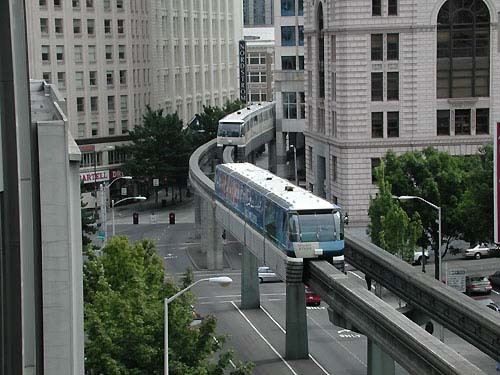 Berger/Abam Engineering, the firm hired to plan a future citywide Seattle monorail system, has a third floor office on Fifth Avenue overlooking the track. This view from the conference room helps provide planners inspiration.